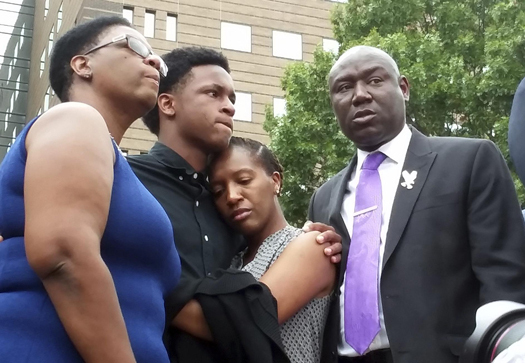 Brandt Jean, Botham Jean’s brother, center left, hugs sister Allisa Charles-Findley at a news conference in Dallas on Sept. 10, 2018. They’re joined by Jean’s mother, Allison Jean, left, and attorney Benjamin Crump. DALLAS—Amber Guyger, the White female, former Dallas police officer who killed an unarmed Black man, has been indicted on a charge of murder following a grand jury’s decision. Almost three months after she fatally shot Botham Shem Jean in his apartment, former Off. Guyger was indicted Nov. 30. Ms. Guyger said she entered his apartment by mistake and thought the victim was an intruder. Mr. Jean’s family and their attorneys were present as District Attorney Faith Johnson announced the charge. Three days after the Sept. 6 killing of Mr. Jean, Ms. Guyger was arrested for manslaughter, drawing national attention and some criticism of District Attorney Johnson and Dallas Police Chief U. Renee Hall. Both are Black women. Many believed Ms. Guyger received preferential treatment because she was a police officer. She was later fired. Mr. Jean’s mother, Allison, and his family are still pained by his death. “I truly believe that she inflicted tremendous evil on my son,” Allison Jean said. Her son was described as a model citizen and mentor from the Caribbean nation of St. Lucia. Ms. Guyger, who had been free since her arrest on charges of manslaughter, turned herself in after the indictment. She posted bond for a second time and was released. District Attorney Johnson said it could be a year before the trial is conducted. Ms. Guyger faces restrictions on travel, unless approved by a judge. She could face life in prison if found guilty. Tammy Kemp, a district court judge will preside over the murder trial. Ms. Kemp is a Black woman and well-known in the Dallas community. Thousands in the Dallas area had called for a murder charge in the killing of Botham Shem Jean. Some were jailed for protests demanding justice. Activist “Brother Shawt,” one of nine Dallas activists arrested and held for demonstrating outside of a Dallas Cowboy’s football game, said, “Amber Guyger got indicted for murder, but what took so long? I am definitely dissatisfied with this investigation.” The Dallas 9 protestors were jailed while demonstrating against the police killings of Mr. Jean and Oshae Terry, a Black man killed by area police officers. The Dallas 9 had complained that they were in custody for a protest longer than Ms. Guyger, who killed a man.